Solving a crime of betrayal (New Hampshire, present-day): Michele Campbell was a NYC Federal prosecutor for eight years before she turned to writing murder mysteries. She Was the Quiet One, her second crime novel (It’s Always the Husband, 2017), opens with the murder of a sixteen-year-old girl who is a twin. Does the taunting title suggest the quieter sister committed the crime? Or, was she the victim? 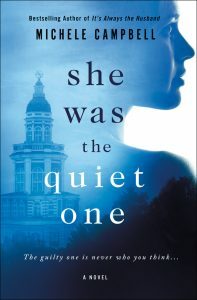 While it doesn’t take too long to identify the quiet one, it’s not until the end of Part I, as in quite a while, that you’ll know which sister was killed. Does that mean her twin is the guilty one? The author’s investigatory chops shine and enhance the suspense as she lays out, one by one, evidence regarding persons of interest. Though one of the sisters is at the center of the investigation, we’re not so gullible to think we’ve solved the mystery early on. So we read like a member of a jury whose job is to pay close attention to the testimony of the witnesses, and to the storylines about witnesses and other characters, doing our due diligence to put aside preconceived notions. Transcripts of police interrogations show Campbell is adept at transferring her detective prowess into first-rate literary skills. Interviews follow a pattern in which characters who knew the girls cough up something suggestive despite being quite guarded about saying much about the sisters and what went on at a very vulnerable time in their lives. The interviews, conducted by a State and a local law enforcement officer, are written in what feels like realistic police procedural dialogue. These either precede or follow chapters that are character storylines, which provide clues as to others who might have committed the crime. This non-linear approach is extremely effective. The opening investigation tells us about a murder that occurred in the middle of the book, and then we read about events that happened before or after later interrogations, also discussed in the detective interviews. These add up to a list of possible culprits beyond the quiet one. Two mysteries then. Which sister was killed? Who did it? Let’s start with Bel and Rose, the twins. Different as night and day. Bel is an undisciplined, blond knock-out; Rose a follow-the-rules, nerdy type. What they have in common is they’re orphans. Their father died when they were young; their bohemian mother just passed away. Forced to leave their home in California, they’re sent to live with their grandmother on her Connecticut estate, another emotional jolt. Grandma comes across as a cold-hearted, wealthy woman with a family legacy of alumnus who attended an elite private boarding school in New Hampshire: Odell Academy. (New England has the greatest number of prestigious boarding schools in the country). With the assistance of grandma’s loathsome attorney/boyfriend, Bel and Rose are shipped off to New Hampshire, another trauma. Both are assigned to Moreland Hall, described as “gorgeous, like something out of a fairy tale. Ivory-covered brick and stone, Gothic arches, ancient windows with panes of wavy glass.” It’s a spread-out campus that borders a “thousand acre nature preserve” with a lake. Lost Lake is where the body of either Bel or Rose was discovered. Depending on the time of day and the constantly changing weather, this fairy-tale can look downright eerie. A perfect setting for a murder. As for witnesses/other persons of interest, two are the sisters’ advisors, also their dorm heads and teachers. Sarah and Heath are married with two young children; they too are Odell alumni. Sarah is Rose’s advisor and math teacher, one of many subjects go-getter student Rose immerses herself in. Rose also babysits for the couple giving her a birds-eye-view of this family. Heath, then, is Bel’s advisor, also her English teacher. Sarah is a hard-working, plain Jane like Rose so they’re a fine match. In fact, Sarah is a better motherly fit than Rose’s artsy mother, who was much closer to unconventional Bel. As Bel’s attraction to a nasty crowd of senior girls is seen upon arrival – the onset of a rift between the two sisters – you can’t help but think Bel might have benefited from someone like Sarah to steady her. Similarly, it wouldn’t have hurt Rose to have been paired with Heath. With his “movie-star” grin, he’s way too handsome for his own good cloistered with cliquish, mean-spirited, uppity, rich students used to manipulating and getting away with everything. Darcy and Tessa are the ringleaders (also suspects); Darcy’s boyfriend Brandon, a follower, becomes one too. Putting teaching credentials aside, Sarah and Heath have been (newly) brought in to improve the school’s naughty image. Bel and Rose enter Odell at the beginning of the school year as sophomores, a distinct disadvantage. Raw over the recent death of their mother, abandoned again this time by their grandmother, they need each other more than ever. Yet each deals with loss in their own way, healthy and not. On their very first day at Odell an incident occurs in the lunchroom that separates the sisters, foretelling the downward spiral of their relationship, testing the limits of the bond of sisterhood, playing into the plot. Could one hate the other so much she’d go to such extremes to kill the other? Perhaps, because the tension does get ugly. But Odell has had its share of scandals before. Chapters alternate between what’s going on at Moreland versus investigating the murder from multiple perspectives. Many voices help us piece together bits and pieces to form judgments. The first witness is Emma Kin, Bel’s roommate. (Another unfortunate pairing as Emma and Rose are well-matched for each other; become good friends.) Emma provides just enough information to glean Campbell’s provocative title might be intentionally misleading. She mentions some kind of an “attack” that “caused the most serious breach between them [Bel and Rose].” Her testimony signals to the police, and to us, the need to delve into what advisor Sarah knows. Sarah is the second witness questioned. She raises more suspicions. As do others, including Rose’s former roommate who abruptly left the school causing shock waves; and Zach, who pines for Bel, then suddenly befriends Rose. Also reluctant to talk, he manages to confirm Darcy and Tessa “have no shame, no limits”; he also refers to big Brandon who intimidates. As you weigh testimonies and narratives, you’re deciding who can be trusted. What stands out is how the author crafts their voices to let us see into their mindsets, their possible motives. The language of the troublemakers is harsh. “People were malicious. They enjoyed inflicting pain,” Sarah says. This so-called exclusive campus is indeed a secluded place. Replete with online bullying, stalking, harassment, “gossip traveled like fire in the wind,” leading and misleading us. New England’s weather is another effective literary tool creating a spooky mood like music does for a scary movie. “Snow tasted of cold, bitter air, and the campus felt desolate, with the wind sweeping across the plaza, and the lights of the library disappearing in the white gusts.” Fog imagery channels dangers that lurk. At the start of Part II, we know which sister’s life has been tragically cut short. The picture isn’t pretty. Neither is the school’s culture, except for those who seek to save it.